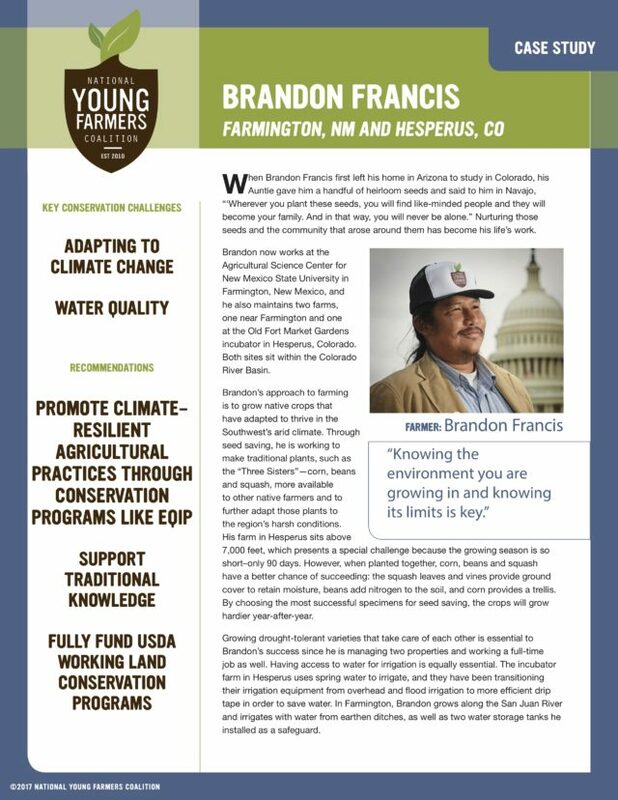 Six case studies of young farmers and ranchers in the Colorado River Basin who are building strong farm and ranch businesses while saving water and forging resilience in the face of a changing climate. The Colorado River Basin includes the driest regions of the U.S. The Basin is entering its 18th year of drought, long enough now for many to wonder if drought—and the temporary aridity it suggests—is still the right term to use. Either way, the Colorado, which supplies water to seven U.S. states and two in Mexico, and feeds over 40 million people, is being stretched too thin. From rapid urban development to increasingly variable snowpack due to a changing climate, the river is being pulled in more directions than it can handle. And farmers and ranchers are the first to feel the pressure. But so many farmers and ranchers, such as those profiled here, are leading the way in water stewardship. They are melding conservation and production agriculture by investing in water conservation and efficiency, soil health, and biodiversity; they are building farmer networks, leaning on traditional knowledge, and trialing new technology. The farmers profiled here grow on anywhere from 1 to over 600 acres. Some come from farm families, while others are starting from scratch. What connects them is their commitment to the land, to growing food, and to ensuring that future generations of farmers and ranchers still have a central place on the land. Ea’mon O’Toole in Savory, WY, the fifth generation rancher running a legacy cow-calf operation and utilizing rotational grazing, stream restoration, and partnerships to enhance conservation and productivity. Despite their leadership, farmers and ranchers cannot meet the challenges of climate change and the pressures of urban water demand alone. While they are taking the lead to build resilience, implementing new practices and technology is costly. Their conservation measures often provide benefits to multiple stakeholders beyond the farm, including recreation, fisheries, headwaters protection, wildlife habitat, and, of course, eaters everywhere. While all of us can support farmers and ranchers in conservation, these case studies call on Congress to fund critical programs in the farm bill that allow farmers and ranchers to enhance agricultural water stewardship in the Colorado River Basin. With the farm bill up for reauthorization, now is the time to ensure farmers and ranchers have what they need to stay in business, and continue their leadership in conservation.